Throughout his career, John Mellencamp has had to fight, whether it was for the right to record under his own name or for respect as an artist. Of course, he never made it easily on himself. Mellencamp began his career in the late '70s as a Bruce Springsteen clone called Johnny Cougar. As his career progressed, his music became more distinctive, developing into a Stonesy blend of hard-rock and folk-rock. His musical development coincided with his growth in popularity — by the time "Hurts So Good" and "Jack and Diane" became hits in 1982, Mellencamp had created his own variation of the heartland rock of Springsteen, Tom Petty, and Bob Seger. While he had the record sales, it took several years before rock critics took him seriously. For some artists, this would be easy to ignore, but Mellencamp had the desire to be a serious social commentator, chronicling the times and trials of Midwestern baby boomers. Scarecrow, released in 1985, fulfilled his wish of being taken serious, and every record he released after it was greeted warmly by critics. Furthermore, he sustained his popularity into the late '90s, only occasionally experiencing dips in record sales. A prolonged, acclaimed career seemed an impossibility when Mellencamp released his first album under the name Johnny Cougar in 1976. As a child in Seymour, Indiana, Mellencamp had suffered a number of setbacks, including being born with a neural tube defect called spina bifida that necessitated a lengthy hospitalization as a baby. As a teenager, he was rebellious, often getting in trouble with the law. He formed his first band at the age of 14, and continued to play thoughout his teens. When he was 17, he eloped with Pricilla Esterline, his pregnant girlfriend, and proceeded to try to support his family by working a series of blue-collar jobs. By the time he was 24, he had decided to move to New York City to attempt to break into the music industry. In New York, Mellencamp became a client of David Bowie's manager Tony DeFries, who signed him to a lucrative with Mainman/MCA. Mellencamp recorded an album of covers called Chestnut Street Incident. Upon receiving the finished album in 1976, he was infuriated to learn that DeFries had billed the singer as Johnny Cougar. Chestnut Street Incident was bomb and MCA immediately dropped the singer. The fiasco of his first album was enough to sour Mellencamp toward the industry for the remainder of his career. Two years later, he signed with Riva Records, releasing A Biography (1978) to little attention. However, John Cougar (1979) spawned the Top 40 hit "I Need a Lover," which also became an AOR hit for Pat Benatar a few years later. Steve Cropper produced 1980's Nothin' Matters and What If It Did, which contained the Top 30 hits "This Time" and "Ain't Even Done With the Night." John Mellencamp's next album, 1982's American Fool, became his breakthrough, both commercially and musically. More focused than his earlier records, American Fool rocketed to number one on the strength of the number two hit "Hurts So Good" and the number one single "Jack & Diane," both of which were supported by videos that became MTV favorites. 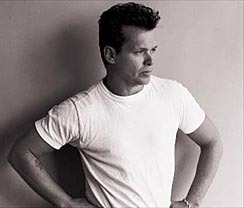 The success of American Fool meant that he could add "Mellencamp" to his stagename, and 1983's Uh-Huh became the first album credited to John Cougar Mellencamp. Uh-Huh was released while American Fool was still high on the charts, and it became a number hit, peaking at number nine and generating the Top Ten hits "Crumblin' Down" and "Pink Houses," as well as the Top 15 "Authority Song." He supported the album with his first headlining tour. While he had commercial success, Mellencamp made his bid for critical acclaim with his next album, 1985's Scarecrow. Scarecrow displayed a greater social conscious and musical eclecticism, resulting in his best-reviewed — as well as his biggest — album to date. Peaking at number two, Scarecrow generated the Top Ten singles "Lonely Ol' Night," "Small Town" and "R.O.C.K. in the U.S.A." Following the release of the of Scarecrow, Mellencamp became an outspoken advocate of the American farmer, organizing Farm Aid with Willie Nelson and Neil Young. He also became known for his anti-corporate stance, refusing to accept tour sponsorship offers from beer and tobacco companies. Mellencamp continued to explore social commentary and new musical avenues with 1987's The Lonesome Jubilee. Featuring a distinct Appalachian folk and country influence, The Lonesome Jubilee was a melancholy elegy for the forgotten middle America, and while it was more adventurous than its predecessors, it was another hit, peaking at number six and generating the hits "Paper in Fire," "Cherry Bomb" and "Check it Out." Mellencamp continued to explore American roots music on Big Daddy (1989). While the album received generally good reviews and peaked at number seven, it failed to produce a big single. Two years later, he returned with Whenever We Wanted, which was another moderate hit, peaking at number 17. Human Wheels (1993) received some of Mellencamp's strongest reviews, yet the record didn't generate a hit single and quickly fell down the charts after debuting at number seven. Mellencamp bounced back into the Top Ten in 1994, when his duet with Me'Shell NdegeOcello on Van Morrison's "Wild Night" peaked at number three. Its accompanying album, Dance Naked, became his biggest album since Big Daddy, going gold months after its release. Mellencamp planned to support the album with an extensive tour, but he suffered a major heart attack in late 1994 that necessitated its cancellation. Mellencamp spent 1995 recuperating, re-emerging in 1996 with Mr. Happy Go-Lucky. Produced by Junior Vasquez and demonstrating a slight dance influence, Mr. Happy Go-Lucky was greeted with positive reviews and featured the minor hit single "Key West Intermezzo (I Saw You First)," which helped the album go gold. The album was his last for longtime label Mercury, and he moved to Columbia for 1998's John Mellencamp. Rough Harvest, a collection of unreleased material, appeared a year later.